For stepmoms, try to see the mom as a woman who is going through the emotions of a failed relationship and sharing custody of her kids. For moms, try to see the stepmom as a woman who is coming into these new family dynamics, unsure of her role and responsibilities. The more we can be open and accepting of one another, and cut each other some slack, the more chance we have of actually being able to get along (or at least not dislike one another!). Church notes that “the stepmother-ex-wife relationship often seems fated to be adversarial” (p. 76). But this dynamic is completely within our control. If we choose empathy instead of mistrust and competition, there can be a great deal more harmony for stepfamilies. Changing your relationship with the Mom doesn’t have to require her involvement at all. While it may be ideal for you to come together and co-parent in a peaceful, supportive way (and this is what we would like to see for ALL stepfamilies! ), if this is not possible in your situation, you can STILL change things. As we move into February, a month when we often think of love and relationships, we encourage you to extend some of that love in the Mom’s direction. Complete the form below to grab your FREE month of love challenge calendar, filled with an idea every day to help you gain new perspective and improve your co-parenting relationship with the Mom. Every small step we take towards peace and understanding, is a step toward peace for our family, and ourselves. Subscribe to Get Your FREE Stepmom Month of Love Challenge! 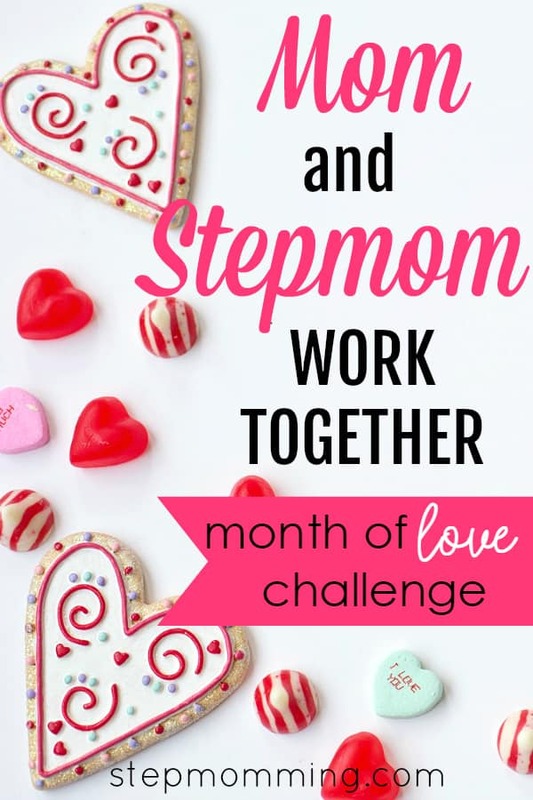 Exclusive for Stepmomming subscribers, a FREE month of love stepmom challenge sent directly to your inbox! In fact, when you subscribe, you’ll get access to ALL of our freebies! About Erin: I’m a Navy wife, Mom to baby girl Grace, and stepmom to two awesome kids. I am the Director of Education and the Ambassador Program for Social Stepmom, and helping stepmoms is my passion! I researched the stepmothering experience for my PhD, and I blog at steplife.info. Check out my courses and articles through Social Stepmom on Instagram, Facebook, and Twitter.